The purple boundary in the map below outlines the watershed of your adopted waterway. When it rains, water that falls within this boundary eventually finds its way to your stretch of Mill Creek. 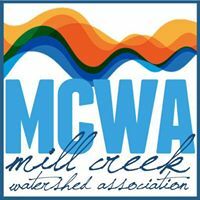 Mill Creek's water is directly impacted by all land within the purple drainage boundary. The yellow line represents Knowledge Academies' adopted stretch of Mill Creek. Stewardship activities performed on land or water anywhere within these purple watershed boundaries will improve the condition of your waterway.